NEURONS is hosting Northeastern's Brain Awareness Week, a national annual week of events promoting brain research and knowledge. This year we have the priviledge of hosting Dr. Newton Howard, founder of the Mind Machine Project and leader of the Synthetic Intelligence Lab at MIT. 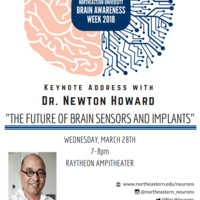 He will be presenting a talk entitled, "The Future of Brain Implants and Sensors" in Raytheon Ampitheater at 7pm Wednesday, March 28th. The event will be catered, and all are welcome to attend!